Located in the historical old town, close to the picturesque harbour, Taergesen Guest House offers visitors to Iceland charming and affordable accommodation in Reydarfjordur, one of the largest eastern fjords. The area is famous for its stunning scenery and opportunities for salmon fishing. History lovers will also find the Icelandic World War II Museum well-worth a visit, and this delightful alternative to a hotel is the perfect place to stay for a number of attractions. 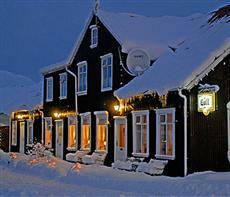 Built in 1870, the guest house oozes typical Icelandic charm, with small cosy rooms and a warm ambience. Staff will be delighted to help you with your holiday requirements, and you are guaranteed a high level of hospitality and attention to detail. Relax in the TV lounge and chat with the other guests in the cosy armchairs, or sit on the outdoor benches and admire the magic of the Aurora Borealis, for a truly memorable experience. After your day exploring in the breathtaking landscape, return to the welcoming interiors, enhanced by great dining. Your appetite will be more than satisfied by the diverse menu of the day, including pizzas, hamburgers, sandwiches and other delectable dishes.